A high value $3 off coupon is currently available here, however make sure to print it out asap, since it most likely won’t last long. More coupons available as of May 24th! Check out Persil coupons. 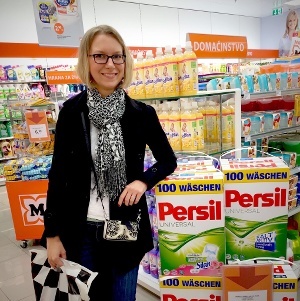 As you probably already know, I am a huge fan of German Persil and got very excited last week when the launch of Persil ProClean was announced in the US. Unfortunately, none of my local Walmarts were carrying the Persil ProClean line yet, so I reached out the the folks at ProClean and they were kind enough to send me some samples. I received them yesterday and of course had to put the US version of Persil to the test straight away! Here are my first impressions, and I will be doing a full comprehensive review after I’ve used the detergents for a while. Edit June 5, 2015: Consumer Reports has named Persil ProClean 2-in-1 liquid their #1 top rated detergent! Read more here. I have to start out by saying that I did not go easy on Persil ProClean. The German version is an outstanding detergent, so the bar was set very high. In fact, I actually put the ProClean through even more than I would regularly subject German Persil to just to see how it would do. 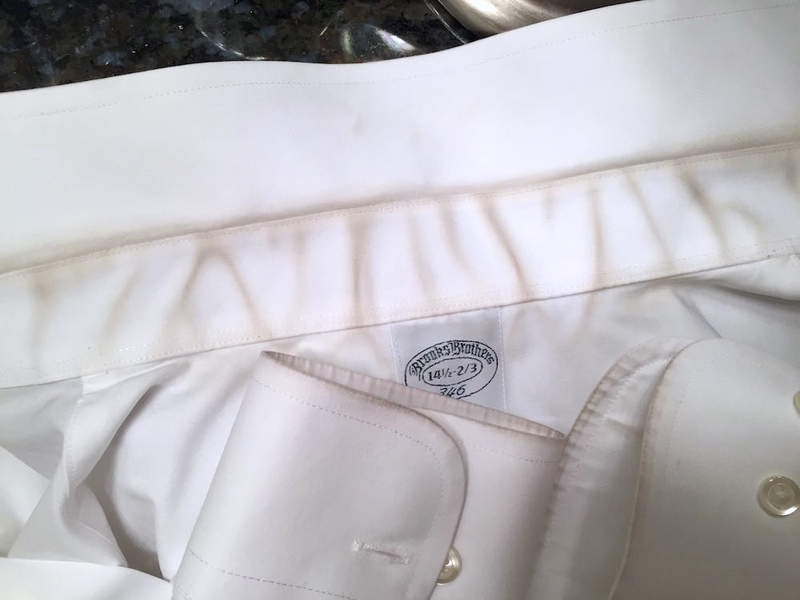 Now, normally I would do the following with a shirt this dirty: first wet the cuffs and collar with warm water and pretreat with Ecover stain remover, using the brush to really get the product into the stains, then set aside for 30 minutes. After that do a prewash (Miele calls this “Heavy Soil”) with Biz and use the Extra White/Hot (60C/140F) settings on my Miele W3038 with 3 Tbsp of Persil Universal Megaperls and an added 1 Tbsp of sodium percarbonate. The Extra White setting is great for stain removal, since it’s quite long and the clothes are tumbled fairly aggressively, and along with Custom it’s one of my favorites for heavily soiled/stained clothes. But I wanted to really push the Persil ProClean, so I did not give it nearly as much help as I normally would my regular detergent. 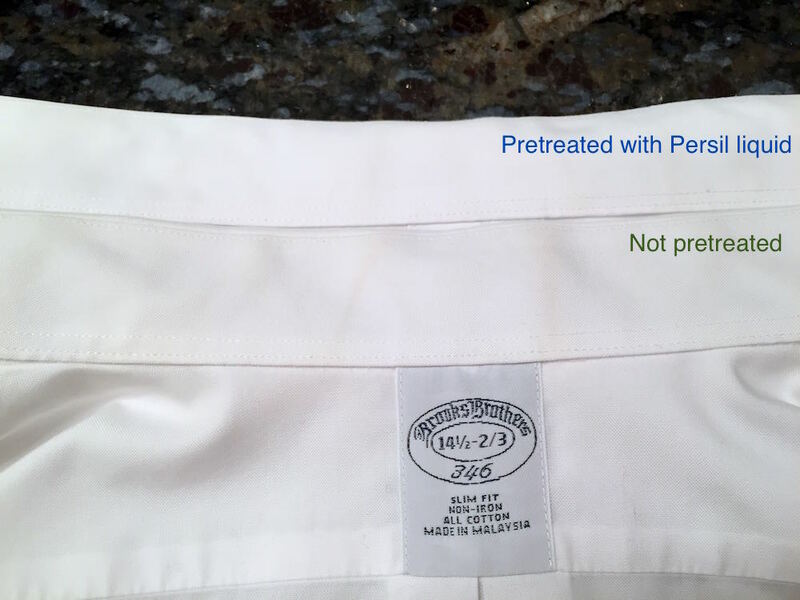 I chose to use only Persil ProClean products (so no other additives), and decided to experiment even further by pretreating the collar and cuffs of one shirt with some ProClean liquid, and washing the other without pretreating. I did not use warm water or a brush, just applied the liquid to dry fabric, pushed it in with my finger and let it sit for about 5 minutes. One shirt got pretreated with some Persil ProClean liquid, the other didn’t. I buttoned the gauntlet buttons of the untreated one to tell them apart. 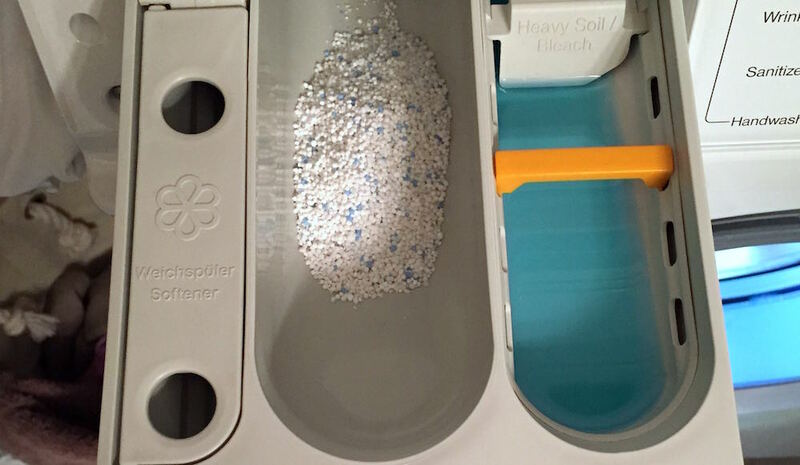 I then chose to use about 2 Tbsp of the Persil ProClean Original liquid as a prewash (“Heavy Soil”) and 3 Tbsp of the Power Pearls for the main wash. I used about as much product as I would with German Persil. 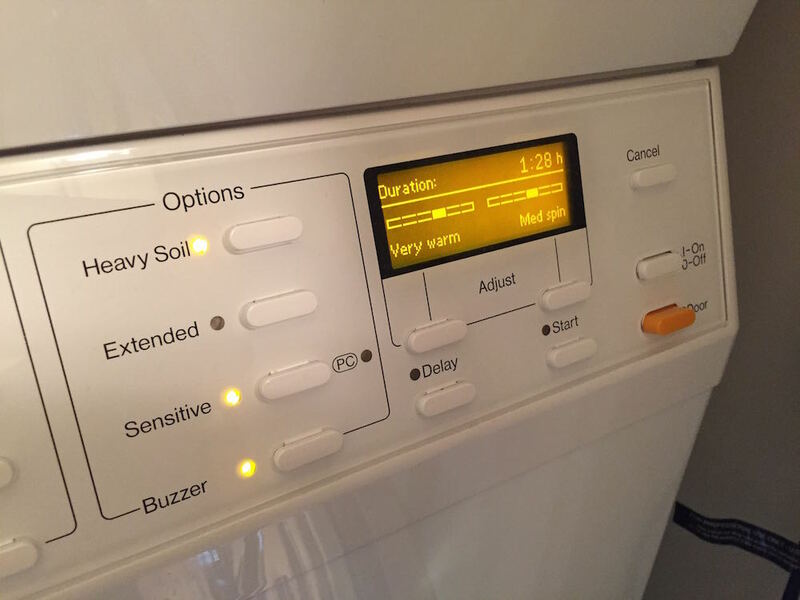 I then decided to use the Wrinkle Free setting – it is a shorter cycle with less aggressive tumbling than the Extra White that I would normally use, and set it to Very Warm (50C/122F), since that is the hottest most standard US washing machines will go. I also added an extra rinse, since that is my standard MO. Note to self: the liquid is fairly thick, so next time I won’t use the liquid dispenser insert – it didn’t wash out of it well. However, in spite of that the overall results were pretty amazing! 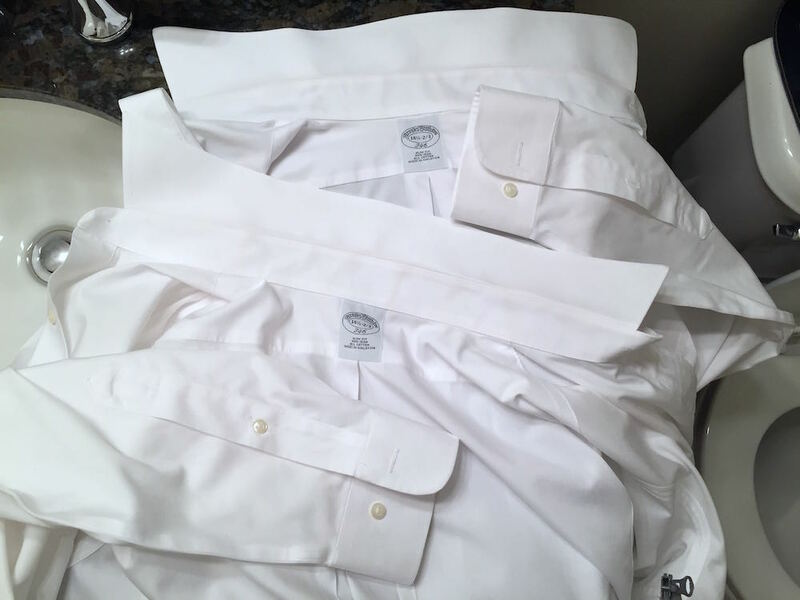 The pretreating made a huge difference in the collars – the shirt that I had poured some Persil ProClean Original Liquid on before the wash came out virtually spotless. The dress shirt that I washed as is had some very faint stains left over. However the cuffs came out spotless on both shirts, so next time I won’t bother pretreating those. Overall, I am VERY impressed with the new Persil ProClean line! I will be posting a more thorough review once I’ve used it for a couple of weeks, however I already know that it’s a great detergent that can finally provide some real competition for Tide. The price points for the two detergents are similar: you can get a small, 20 load bottle of liquid for around $5, a 50 load bottle for around $10 and a large 96 load pump bottle for $18; Persil ProClean is currently sold only at Walmart both in-store and online. Persil ProClean is now available at a number of retailers in the US. I’ve seen the detergent at CVS and RiteAid, as well as at a number of supermarkets and of course on Amazon. …and here are the results of washing with Persil ProClean! And now some notes for German Persil lovers on how Persil ProClean compares: the scent is similar but not identical, and stronger than of the German detergent (and it airs out well, unlike Tide). All Persil ProClean formulas contain optical brighteners and the Power Pearls contain sodium percarbonate and TAED. The Pearls contain zeolytes. The formulas of the DE and US versions are not identical – fortunately the ProClean folks list the ingredients on the website so you can compare. It’s also a little more prone to sudsing, probably to accommodate the US top loader consumer who is used to seeing more froth during the wash. The Pearls come in a plastic bottle which I find very convenient (you can take out the pouring spout), however the measuring lines on the lid are impossible to read, so I measured the recommended amounts, and they indicate 3 Tbsp for a regular load and 5 Tbsp for a large/heavy load for both the Pearls and liquid – this corresponds to about how much German Persil I was using per load. MORE FROM OLGA’S LAUNDRY My Top Ten Green/Natural Kitchen Cleaners Reviewed - Seventh Generation, Method, Ecover and more! Have you already tried the new Persil ProClean line? Do you plan on trying it out? I’d love to hear your thoughts! The Persil brand kindly provided me with samples of Persil ProClean laundry detergent, however all opinions expressed are my own. Can you tell me if your products contain methylisothiazolinon or methylchlorioziatalinone ? You can actually see the full ingredients list on the Persil website. I took a quick look at the Original liquid and pearls and did not notice either of those ingredients! Hi Sherry! How exciting to find another fellow laundry nerd!! Have you been using the pearls or the liquid? I have a theory that zeolytes in the powder/pearls really contribute to stiffness in clothes, and also make them more prone to wrinkling. However liquid doesn’t contain zeolytes, so if you’re getting that issue with the liquid it could be the lack of some type of polymer that Tide contains that softens clothing. Thank you for your response! I’m using the liquid Persil (blue in color). I agree with your remarks about the polymers. I have added a small amount of liquid Tide, which seems to significantly decrease the wrinkles. While I love how clean my clothes seem to be from the Persil, the wrinkles are a deal breaker. We do not have a young family or careers in which our clothes are super dirty. Thus, I’ll continue to use the Persil, mixing it with Tide. Do you know if the Persil (not sure what they call it, the perfume free one) is as effective as the regular Persil? Oh how great that you’ve figured out a solution! And a brilliant one at that. As for the Sensitive Persil, it’s actually not perfume free… They claim to have a “hypoallergenic perfume” added, which is quite the oxymoron. The ingredients lists look to be about the same, although the Sensitive does have an extra polymer added. I got pretty excited at first, thinking that it might solve your wrinkling issues, but a quick google search showed that it’s just there to impart the milky look. Boo! I myself haven’t tried it yet – it doesn’t come in small 20 load bottles, and I prefer to test a new detergent out first before investing in a large package. Let me know if you end up giving it a try! Thank you for sharing TF! I haven’t done any laundry soap testing since I was in middle school and did a comparison for a science experiment. In that test, Era won out over Tide, Cheer and Whisk. But that was over 20 years ago, so I’m sure advances in detergents have been made. What are your thoughts on Era? I’m very interested to try Persil. Which do you think cleans the best; the dry or liquid? I have 3 young children who are very messy eaters and a husband who has a penchant for dripping food on his shirts. I’m terrible at pre-treating his clothes and sometimes have to rewash his shirts because he’s found a stain after it’s been washed and dried. The rewash with a pretreat of Shout or Era usually solves the problem, but it’s such a pain to have to rewash everything. Thanks for your advice. I’ve actually never tried Era! As for Persil, I definitely prefer the powder: the liquid is very sudsy in my water and also very strongly scented, so I don’t use it much. However, if you’re used to liquids you might find that clothes come out not as soft as with a liquid detergent, and for some that can be a deal breaker. If you’re mostly happy with Era, another option would be to add a booster – something like Oxiclean (there’s an unscented version for kids available if you prefer that), Oxo-Brite (this is on my “try next” list, best price I’ve found is on Vitacost: http://www.vitacost.com/earth-friendly-oxo-brite-for-laundry-and-stain-removal), Biz powder (the most cool water friendly of the bunch – the others require warm to hot water to work) or pure sodium percarbonate. You could either do a prewash/presoak with it or add some to the drum for the main wash. I know that I can’t be bothered to pretreat individual stains, so I stick with the presoak if I know I have some tough ones! Somehow that feels like much less of a hassle. the sodium percarbonate you link is not availabe.. do you suggest in staying with a “kosher” one or does it matter?? ps love persil.. bought some “accidently” when a bag was marked way down on the open containers in the amazon warehouse and i’ve really been wondering if the ones at walmart were the same… thanks for your research!!! Oh sorry about that, I’ll make sure to get that link fixed. Here are a couple of options for you: 2 lb bag, 5 lb bag, both with free shipping. For laundry there’s really not a huge difference between kosher and non-kosher when it comes to sodium percarbonate. Both are s.p. in pure form with no added filler. The German Persil is a little different from the Walmart one – the ingredients are not identical, however the scent is the same. I’d love to hear what you think of the ProClean when you purchase it! actually after reading your review i bought some last night.. i’ve only done one load, but so far so good.. i realize they are different, but it looks like the walmart form does a pretty good job for the price difference.. i am using the power caps, but i am planning on trying the powders in the future.. my husband is very very funny about smells and he sweats alot, and his main complaint was the clothes always smelled dirty and they came out with alot of hair (mine) sticking to them. the persil seems to clean without these issues..
That was funny.I don’t know who would use used toilet paper unelss it was to recycle in the recycling worm cannisters to make good soil for flowers.I was going to put a blog on it because if people recycled everything from their homes, gardens would be beautiful and dumps would have less garbage dumped into them. Does the Persil power pearls contain optical brighteners like the liquid version does? Which would be better to use on darks? Thanks! All of the Persil ProClean detergents contain OBAs, so I personally do not use them for darks. If you’re looking for a reasonably priced powder with no OBAs, you could look into Cheer or the more expensive German version of Persil Color Megaperls. What model washer were you using? I’ve never seen one like that here in the states. Hey Dan, it’s a Miele W3038! I actually have a pretty long blog post about it over here with all the details if you’re interested to find out more. hi there, i have a quick question for you. if you are doing non-white dress shirts like blue or patterned, do you use the hot setting? i’ve been washing in warm but still get some yellow pit stains and was hoping a hotter setting would do the trick. thanks! Hi Anna! 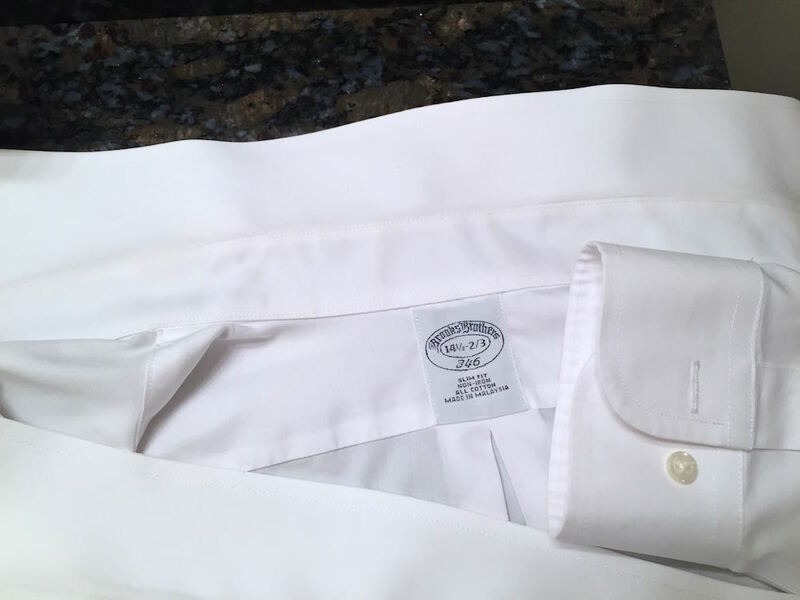 I wash light blue and thin stripe/check dress shirts along with whites at 120F/50C which is the Very Warm setting on my washer. My husband doesn’t have any bright dress shirts where fading or color bleed would be an issue, so can’t speak to those. Not sure how hot your Hot setting gets, but I’d give it a go. Do you pre-treat the stains at all? That might be a good option for more saturated colors, also a warm soak overnight should help for anything you don’t want to expose to Hot. thank you for the quick and detailed response! yes, light blue and striped is what i meant. good to know you wash in very warm. i’m assuming that’s my hot. i have a whirlpool duet with steam clean feature. i think it’s a good machine but i’m not sure if i’m using it to its full potential. the instruction manual doesn’t offer much (though one would think a washer would be fairly self explanatory lol). i do pretreat sometimes but i will admit i’m a lazy launderer. i recently purchased the clorox 2 spray pre treat so we’ll see how that works. i also presoak but one thing my machine doesn’t have is a separate detergent dispenser for presoaking. i think it takes the detergent from the main wash, uses it for soaking, then continues onto the wash.
Hi Olga! I came across your blog while researching Persil v Tide. My parents started using Persil recently and when I walked into their house my first comment was, “It smells like Europe!” (where we’re from originally). That SMELL! I’m looking forward to giving it a go, since the Tide Free is not quite cutting it anymore. Thanks for your great blog with all the info. I feel like I can up my laundry game considerably now, and will check around for both the classic and the Color versions. Hello I found you because of a comment you made re lines on caps of detergent bottles being hard to read. I have been comparing amounts of liquid in Tide caps and have been attempting to save as much liquid as possible without throwing cap into wash AND ways to clean the nasty cup. I just squeezed the lady amount out of a hole I punched in the bottle. Anyways, how does Tide with Febreze compare to Persil? I have never heard of this brand. 1. Since they’ve been like this for so long (and one wrinkle is that they have been washed and put through the dryer many times now), will some of them be “too far gone”? 2. Before I try Persil, anything pre-treatment I can use to boost my chances of success? Like I said, these are my favorite shirts and I’d hate to donate them or otherwise throw them out because they are otherwise in really good condition (all cotton, some Egyptian, and some colored or at least striped), but I may be a closet laundry nerd because it really bothers me whenever I see those stains because they ARE gross!!! Hi George, so as much as I hate to say it, but there is a chance that nothing can be done at this point… That being said, here’s what I’d try on the white/light shirts (and only if you’re willing to risk it! ): I’d get some powder oxygen bleach (OxiClean, Charlie’s, OxoBrite, or pure sodium percarbonate, or whatever you choose), make a paste out of a bit of liquid detergent and the oxygen bleach and spread it over the stained areas, put all of that in a sink or dishpan and pour HOT (boiling if you’re willing to take some serious risks and if these are 100% cotton) water slowly on that area, and then let it soak for a considerable amount of time – several hours to overnight. If you’re using a dishpan you can cover it with foil to keep the heat in longer. There’s no need to submerge the whole shirt, you want a super concentrated solution hitting the stained areas directly. 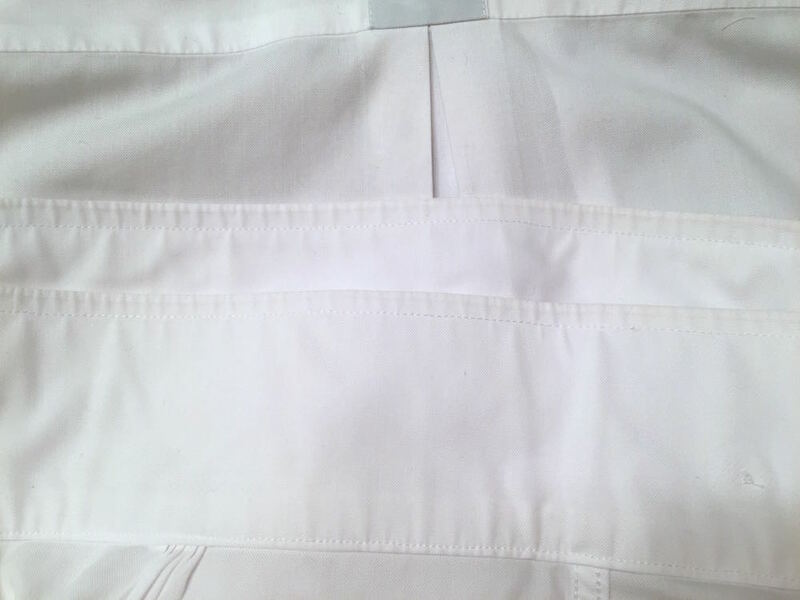 I’ve gotten some insane stains out with the help of boiling hot water and oxygen bleach, but the obvious risks are losing stretch if there is any amount of synthetic in the fabric, shrinking, and discoloring unevenly. If you’re not willing to risk that much, let me know how you usually launder them and we can think of less drastic ideas to get those stains out. 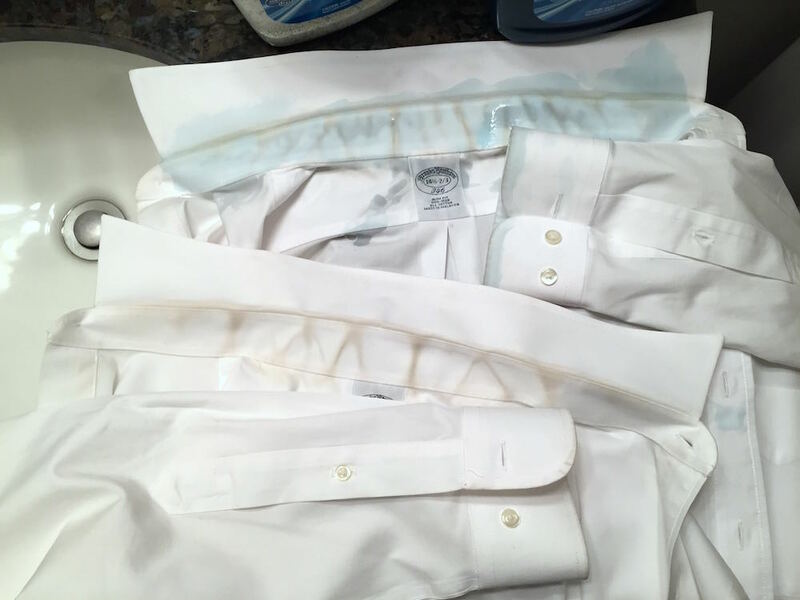 To avoid this in the future, you want to pre-treat your collars with something before the wash (a bit of liquid detergent or stain remover – I haven’t found it to make a huge difference other than stain removers can be easier to apply), use hot water on your white and light cottons (I throw my husband’s light blue and white with blue stripes dress shirts in with the whites load), and add oxygen bleach if using a liquid detergent or use a good powder detergent for whites. Can you tell me whether Persil ProClean has any chemicals that are estrogen modulators, or endocrine disturbers?